New Delhi: The second largest Arab telecom company by market value, Emirates Telecommunications Corp., or Etisalat, said on Tuesday it has agreed to buy a 45% stake in Swan Telecom Pvt. Ltd that recently acquired licences to provide mobile telephony in India. The deal would have to be cleared by the Foreign Investment Promotion Board, or FIPB, telecom minister A. Raja said on the sidelines of a function in New Delhi. United Arab Emirates-based Etisalat said by email from Abu Dhabi that it has agreed to buy some 45% of Swan Telecom for cash up to $900 million (Rs4,113 crore). The remaining 55% of the shares of Swan Telecom are held by several entities, including its promoters Dynamix Balwas Group, the email said. The Business Standard newspaper first reported on Tuesday that Etisalat would pick up 49% in Swan Telecom and increase the stake to 51% after FIPB approved the deal, quoting unnamed sources. Etisalat offers phone services in 16 countries across Asia, West Asia and Africa, servicing more than 64 million customers. The company reported annual net revenues of $5.8 billion and net profits of $1.83 billion for 2007. Etisalat also has a fully owned subsidiary in Bangalore, Etisalat Software Solutions, that sells operational and billing support systems to the telecom industry. Mumbai-based real estate and hospitality group Dynamix Balwas Group has assets of about $4 billion. 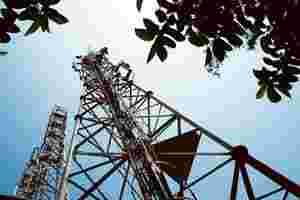 Swan Telecom has got licences to provide mobile phone services on the GSM, or global system for mobile communications, technology platform in 10 out of 22 telecom circles in India, and is awaiting clearance for another two circles, the company said. “This is good news as the move to expand globally beyond its operations in the UAE is expected to be viewed positively because that way it diversifies its operations and does not depend on only one market," said Sherif Abdelkhalek, institutions account manager at Beltone Financial, an investment bank operating in West Asia and North Africa. “The share price might not immediately react to the news because of current market conditions but in the long and medium term, this will benefit revenues and share price," Abdelkhalek said. Citigroup Global Markets Ltd and Deutsche Bank AG were advisers for Etisalat and Swan Telecom, respectively. Swan Telecom’s Balwa said Indian shareholders would remain the controlling stakeholders in Swan Telecom after the Etisalat deal. A telecom expert said Etisalat always wanted to come to India and only new players could be its potential candidates. “Given the telecom licence and roll-out obligations, and what they want to do, there is always a certain valuation attached to it," said Rajesh Jain, national industry director for information, communication and entertainment practice at consultancy KPMG India Pvt. Ltd.
Ola Galal and Devidutta Tripathy of Reuters contributed to this story.